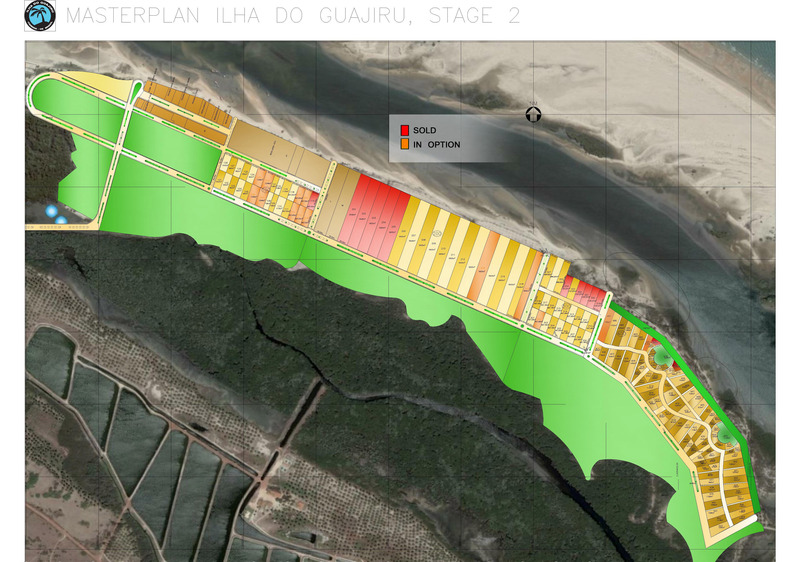 After numerous sales of land were recorded on Ilha do Guajiru, appr. 13 plots were sold in less then 6 weeks, all small beachfront plots of area 300, running from 319 to 327 have now meanwhile been sold!, the management of the island has decided to launch stage II of the Masterplan really soon. This stage is truly very promising and for sure surprising! Various open spaces are planned in this beautiful, island interior based stage II, in order to serve as squares, or commercial or other activity area's: like simply enjoying from terraces and plateau's the stunning views towards the secret spot! In the middle of these squares, some spaces will be offered for running a nice bar or restaurant, with space around it, like in jericoacoa, where you find a zig-zag city plan, giving a lot of atmosphere to the village in it's total. This is what Ilha do Guajiru has to offer, atmosphere and cosyness, amidst the abundant palm trees everywhere! The Masterplan will be released soon, then you will find the details on the section "real estate" of this website. Here at this page you'll find a preview. Some very attractively located building plots are offered to you, the 1st deciding buyers!